The President, Shri Pranab Mukherjee visiting the Vikramshila University Monuments and Museum, at Vikramshila University, in Bhagalpur District, Bihar on April 03, 2017. Patna: The President of India, Shri Pranab Mukherjee visited Vikramshila University Monuments and Museum today (April 3, 2017). Speaking on the occasion, the President said that he was happy to come to Vikramshila University which is being established on the site of this ancient centre of higher learning and to visit the monuments and the museum. They reflect an era where a rich culture of learning flourished in the region. It is heartening to find that after meticulous excavations carried out over the last few decades, it has been decided to revive this seat of learning. He also complimented the Archaeological Survey of India in this regard. 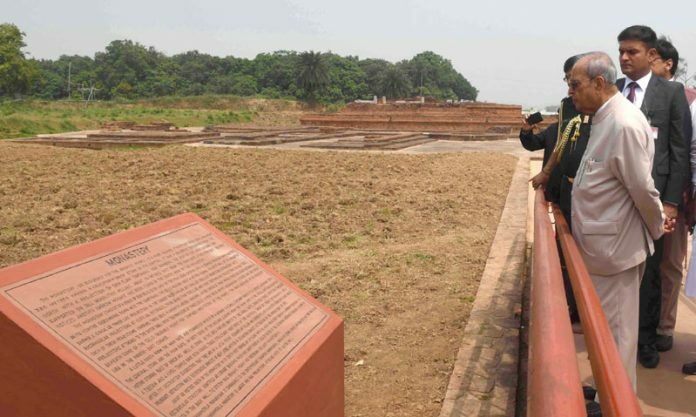 He stated that resurrection of Vikramshila will be an important step in the preservation of our civilizational ethos. The President said that India has had a long tradition of knowledge generation and propagation. Scholars from distant lands frequented our country, attracted by the philosophy and wisdom of our ancient civilization. In ancient India, Universities such as Vikramshila, Nalanda and Taxila etc. attracted students, teachers and researchers from all over the world. He said that it is important to revive the glory of Vikramshila University.